At Londonist we never knowingly turn down the offer of a canape and glass of sparkly. One particularly quiet week we were even spotted at the Smoked-Meat Purveyors Buffet And Mingle. This is not a quiet week - the Tour De France has come to town, so we headed to ExCeL in Docklands to enjoy a bit of collective excitement with media, athletes and event officials at the temporary Tour de France 'Permanence' (French for HQ, apparently). Then we hopped back into town for the Getty Images Gallery's Tour de France special exhibition. To be honest we were already content with the mini croque monsieur we had pressed into one hand and the glass of sea breeze in the other. But this small exhibiton knocked our socks off a bit - curated by Lewis Blackwell, it includes some of the most beautifully historic photographs taken of cycling over the last century. 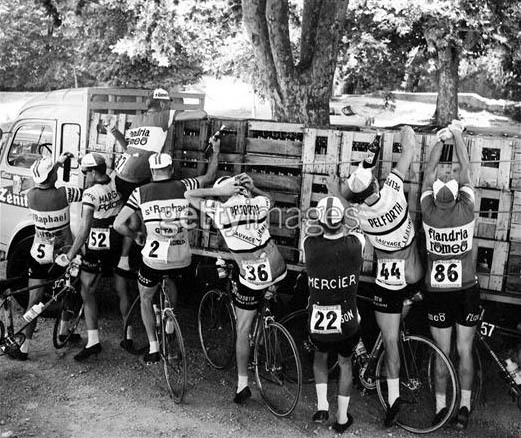 Some of the images bring you right into the middle of the action, others demonstrate the occasionally shocking violence of the sport, while more provide a quirky insight into cycling back into the 1930s. This was the best way to kick off the madness that will hit our streets when the Tour De France starts on Saturday. Wimbledon, Enough! Move aside for the world's biggest annual sporting event. Lovely image provided by getty.